Arguably our toughest game of Mancini's reign takes place today, Everton have been playing better in recent weeks and will be hard to beat. I have a lot of respect for Everton's ability, I think a lot of people have wrote them off but I still think they are a strong side despite their bad patch. I still think that we should win this game as long as we don't become complacent, in recent times we have seen the team take it easy after a couple of wins and expect to win games, if we do that today all our good work of late will be wasted. I have something a little different in my build up today, my good Evertonian friend Anthony or 'Chunky' thought it was a good idea for him to have a little say on today's game and I agree. Well if all goes to plan I will be seeing Chunky at the game today and on behalf of us all I will be sure to tell him how wrong he is! Shaun Wright-Phillips (ankle) and new signing Patrick Vieira (calf) are both said to be fit but may not be rushed into the team. Joleon Lescott (knee), Nedum Onuoha (calf) and Stephen Ireland (hamstring) are all expected to be missing, Wayne Bridge may feature on the bench. Kolo Toure is at the African Cup of Nations and Emmanuel Adebayor is still recovering from that terrible attack on the Togo team bus. Sylvain Distin returned to training this week after coming back from a hamstring injury but is not expected to make his first team return today. Yakubu Aiyegbeni and Joseph Yobo are on African Cup of Nations duty and Lucas Neill looks set to play his last game for Everton before moving to Galatasaray. Possible Man City Line Up: Given, Zabaleta, Richards, Kompany, Garrido, Petrov, De Jong, Barry, Bellamy, Benjani, Tevez. Possible Everton Line Up: Howard, Heitinga, Neill, Baines, Neville, Cahill, Fellaini, Pienaar, Osman, Donovan, Saha. 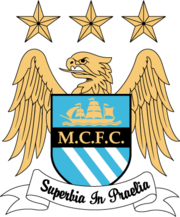 My Prediction: Everton 1 - 3 Man City. Worth A Bet: Nigel de Jong and Benjani score in a City win. "Arguably our toughest game of Mancini's reign??" I don't think there's much argument about it. I'm hoping that Mancini will rest our best players today in prep for the match against Utd. Although it would be great to win today I think its a game we can afford to lose and still have high hopes of finishing in top four. Utd match next week is a MUST WIN match. If Everton win (which is likely whatever team we play)then it will reduce Moyes' satisfaction because he'll know he only beat our 2nd team. I disagree with anon above. I think Mancini should play his strongest team today. The benefit that beating Everton will bring in terms of team confidence will more than make up for the team not being as fresh as it could be and stand us in good stead against Utd. In order to beat Utd thhe team has to believe it can beat Utd otherwise we are wasting our time. Do you always remove any comments which disagree with what you write? No, only the ones that are nasty and just not wanted! If you had a valid point to make on the team news then you are free to make it, but being nasty and swearing is not going to get you anywhere on here.